When you're travelling in the car with your dog, there are a few things you need to do to make sure everyone stays safe. Having an excitable pup with you while you're trying to concentrate on the road could not only be dangerous for everyone in the car, but for other drivers too. The most important thing to make sure is that you're following the law in terms of keeping your dog secure in the car. 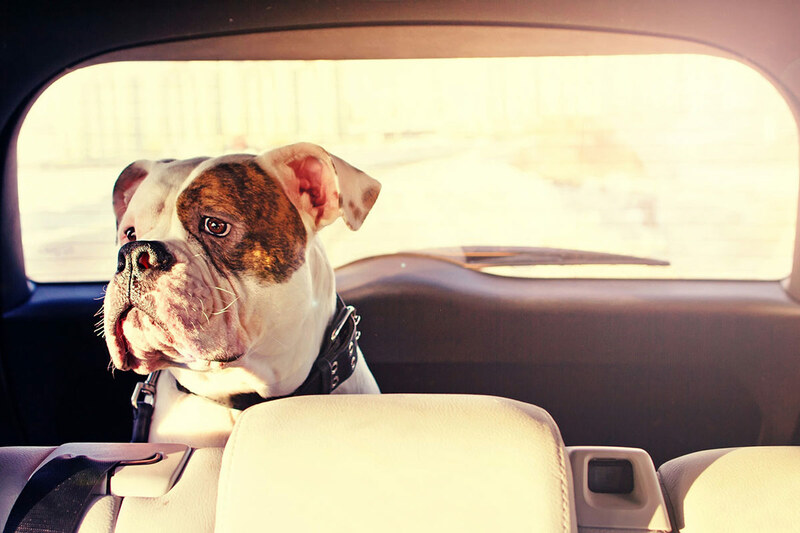 If you're not sure about these details, read our blog on dog car safety to find out more. Firstly, spend some time with your dog in the car while at home/not driving. Keep the boot or car door open and let them get used to the space. Reassure your dog and you can even give them some treats as they start to relax. The next step is to do the same thing but with the doors closed (make sure it's not too hot and the windows are partially open), so they can just experience being in a small space. Just think, some people don't like being in small spaces either! So, give your dog time to get to know the car surroundings. Once your dog is happy sitting in the car with you, start to take them out more on shorter journeys. It's better to know about your dog's potential car habits before you take them on a long car journey! The next step is to ensure you can get them back out the car again safely. A dog leaping out a car as soon as the boot has been opened is a far too familiar scene. And this can be very dangerous for your dog – especially if you have parked in a carpark or on a busy road. The first step is teaching your dog to stay when you open the cage or car door. Practise this at home beforehand and reward your dog when they do this safely. Then clip the lead onto their collar and keep them close by. Of course, it always does well to expect the unexpected. Make sure you keep a bag of travel essentials with you in the car, so you're always prepared. Old newspapers and bags in case of any accidents. Remember to line your dog's cage with newspaper and it's always worth giving them something that will help relax them. This could be a t-shirt that smells like you, their bedding from home or favourite blanket/toy. Keep food and water with you on long car journeys and take regular breaks so your dog can stretch their legs and have a drink. Check your route beforehand so you know of good places to stop on your way. Letting your dog eat before a long car journey can make them feel travel sick, so try and leave time between their meals and being in the car. Calming spray can also help settle your dog in the car so if this has worked on your dog in the past, spray some onto their bedding before travelling. Dogs should never be left alone in cars. Not only because they can die if it gets too hot but even with the window open, a car is classed as a public space. This means if someone sticks their fingers through the window of your car and then gets bitten by your dog, you could be charged under the Dangerous Dogs Act. Your dog must be safely secured while in the car with you. Make sure they are restrained properly by used a dog car seat belt clip. 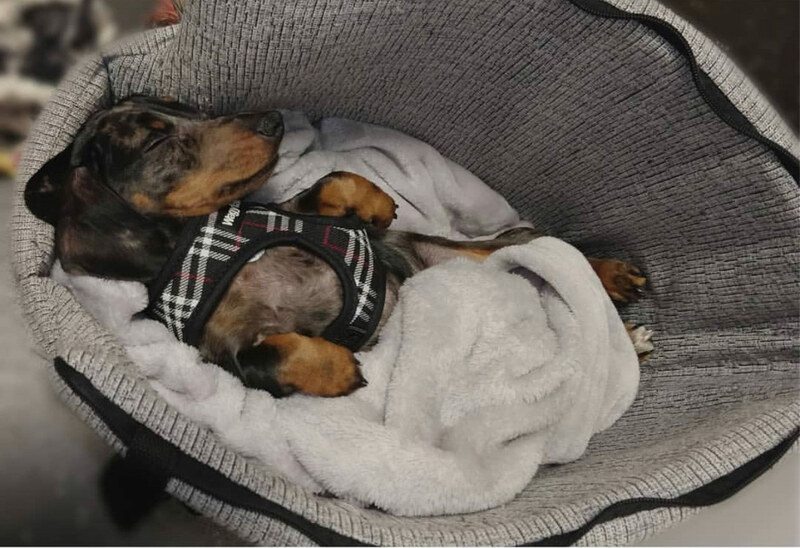 If your dog is small or particularly curious, let them see out the window with a car booster seat. Travelling in the morning will help keep the car cool while you drive. Remember to keep the window open when your dog's in the car, but use a window vent guard to ensure they can't stick their head out. So! Drive safely and keep you dog secure at all times when out on the road. Check out our next blog for tips and ideas for getting settled in your holiday accommodation.